T-Shirt Designer. Prepare the spring and summer season with chic designs that your friends can imagine. It has templates, stickers and examples that can inspire you to make your shirts. 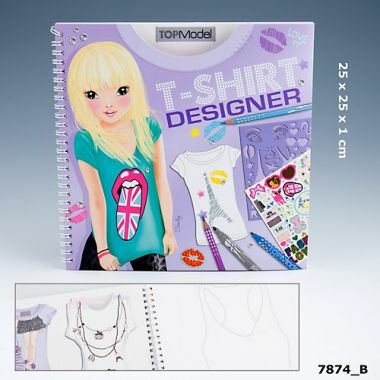 Topmodel Notebook T-Shirt Designer to create your own t-shirt designs. To help you design your own t-shirts Topmodel notebook templates are available with different symbols and letters, and also just to complement your designs with different stickers are also included in the notebook. A good designer shirts can not pass up a book like this.